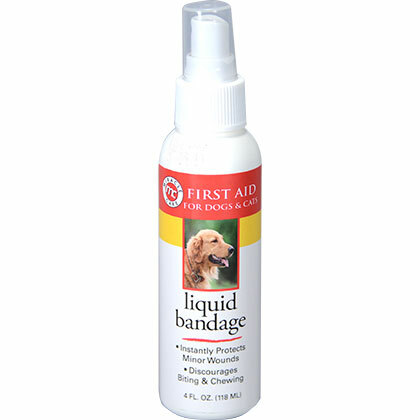 What is Miracle Care Liquid Bandage Spray for Dogs and Cats? The Miracle Care Liquid Bandage Spray for Dogs and Cats instantly protects your pet's superficial wounds by creating a waterproof seal. This seal will prevent water, along with dirt, debris and germs from entering your pet's wounds, which helps reduce the risk of infection. 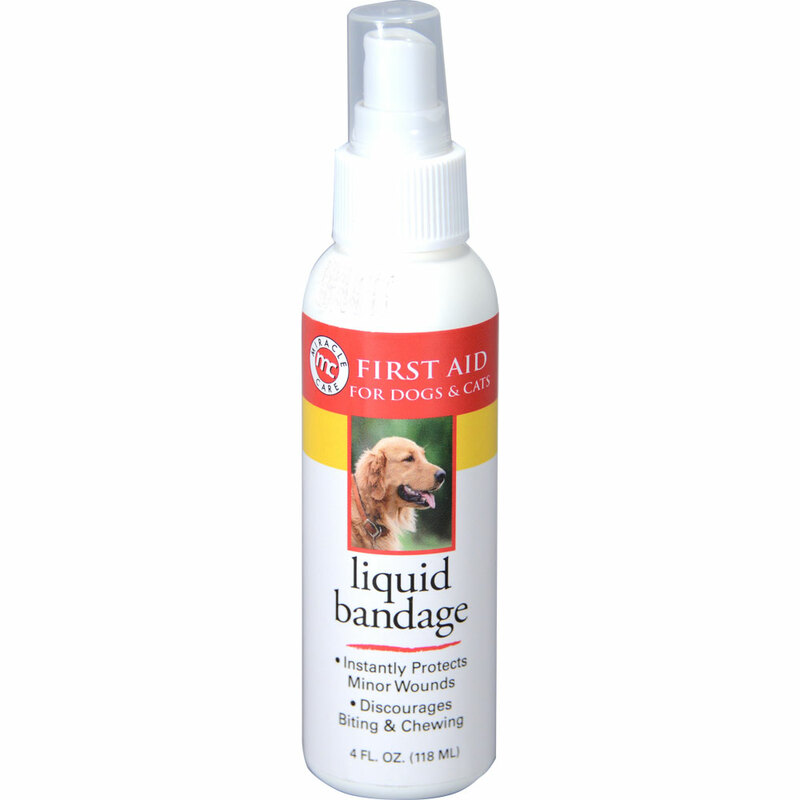 As an added bonus, Miracle Care Liquid Bandage Spray for Dogs and Cats contains a bitter tasting ingredient that deters your pet from chewing or licking at his or her wound to help speed up the healing process. Liquid bandages are designed to soothe skin and promote healing by keeping wounds clean. 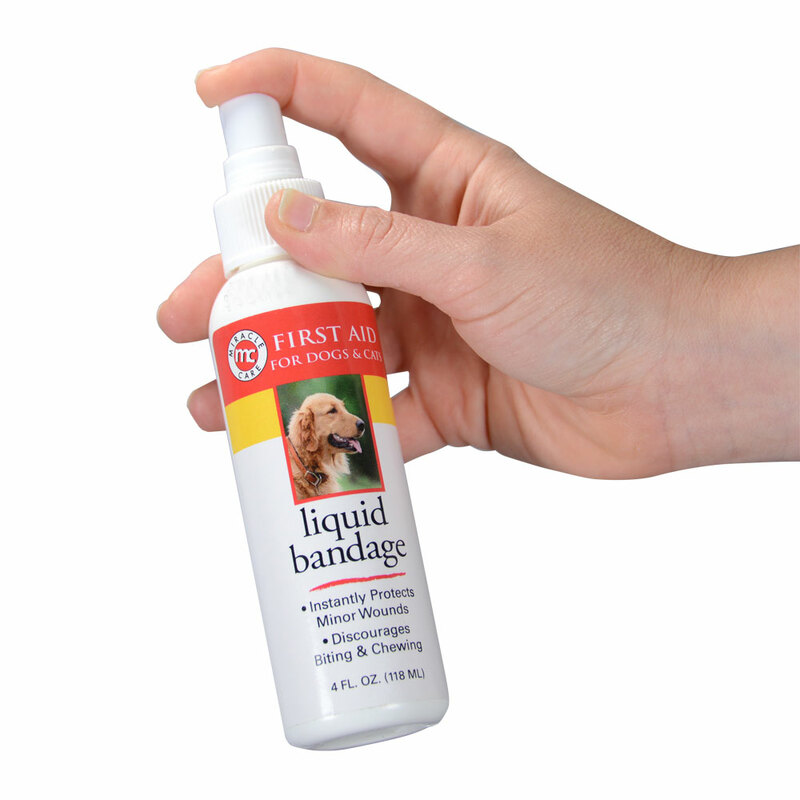 The Miracle Care Liquid Bandage Spray for Dogs and Cats does just that by creating a waterproof seal on your pet's skin to keep foreign objects from entering your pet's wound. If your pet tries to lick or chew his or her wound, a bitter-tasting ingredient deters him or her from continuing. Keep out of the reach of children. For external animal use only. Not for use on deep cuts or wounds, or puncture wounds and serious burns. Not for use on chronic skin conditions. Wash hands after application. Contains a bitter agent. Spray to just cover the affected area. Allow 1-2 minutes to dry and control any runoff. Pat dry any excess product until completely dry in a non-tacky, waterproof film. For wounds that pets won't stop licking, try using a protective cone or collar . Water, Polyvinylpyrrolidone, Sodium Benzoate (preservative), and Denatonium Benzoate (bitter agent).